Friday Poll: Favorite Android Apps Right Now? With so many new Droid users after the launch of the Droid X plus a series of promotions by Verizon to sell off the remaining stock of the Droid 1 and Eris, it’s time for the community to share some knowledge with these newbies. We’ve been seeing a lot of emails lately from new Droid Lifers wanting to know best or most useful apps and I just figured the best people to ask are the readers of this site. Let’s do this in a top 5 sort of way, where in the comments, you list out your top 5 favorite, recommended, best root apps, etc. The list is completely up to you, but we really just want Android newbies to feel on top of the app game in a hurry. Here we go! 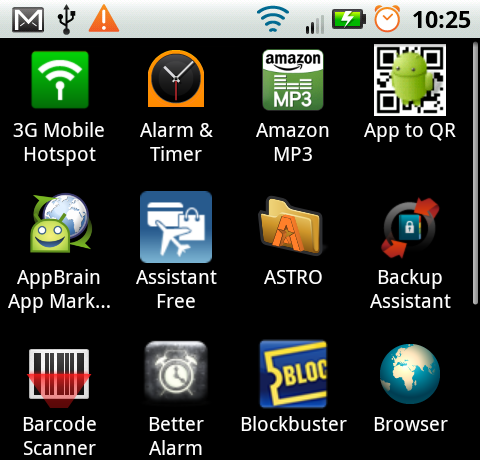 LauncherPro / ADW.Launcher: The top 2 home replacement/launchers on the market right now. Dropbox: Easy access to important files plus simply sharing with friends. Fast Web Installer: Install apps from your PC browser to your phone! Beautiful Widgets: Been wondering what the clock is on all of our screenshots? It’s BW baby. HootSuite: The Twitter app I recommend to any power user. Seesmic: The Twitter app I recommend to any non-power user. Foursquare: For those of you who like to stalk your friends while they eat. SkyDroid: At $1.99, this golf GPS app is a steal. Google Voice: The ultimate voicemail machine. The one number for all phones feature isn’t bad either. Barcode Scanner: Been wondering what those weird black and white boxes are? Scan them with this. Cheers @louiscameron for the idea!